11 July - It seems that the heat wave is coming to an end and a taste of a more normal British summer is in store for us this week, and a damp start to the day in the form of light drizzle encouraged a bit of a 'lie-in' in the boxes. 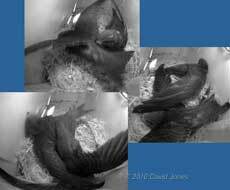 and this picture of SW(UP), captured moments later shows that one adult at least has taken to the skies. Also, it illustrates an ordered, rather 'nubbly/dimpled' texture to the cover provided by the body feathers that shows up on the Swifts in certain lighting conditions. It is something I haven't noticed on the other birds that I've watched. Usually I get the impression the body feathers overlap towards the back to provide a smooth surface. I can't help wondering if this more rippled surface could provide a useful drag-reducing effect during the Swifts' high speed manoeuvres by creating a thin layer of turbulence over the body. Much as the dimples do on a golf ball, perhaps they help reduce the wake behind the bird to improve the airflow? Perhaps I'm totally wrong! 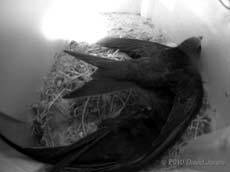 Wing stretching has been taking place in both boxes today. 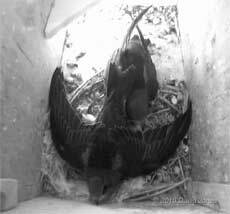 In SW(UP) one of the pair chose to stretch right below the camera, giving a decent view of the body and tail. It is interesting to compare that image of a Swift nearly ready to fledge with this even clearer one of this younger chick in SW(LE), with its stubby tail. 12 July - Just a short entry on a cooler day with the temperature into the mid twenties rather than approaching thirty. 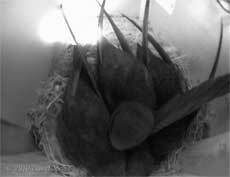 tonight, both families are present and correct in their nests. Outside, the flying displays by adult Swifts seem to be winding down somewhat, with many fewer low passes and less screaming today. 13 July - A wet, cool start, with low cloud (the cloud ceiling at Farnborough at just before 8am was being given as 400ft), light rain, and the temperature in the garden at around 15C. Despite this dull start both sets of parents left their nests at just after 8am, although I see that the mother, 'White Spot' is back in SW(LE) at 8.15am. 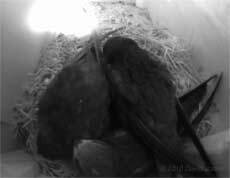 Both pairs of chicks remain huddled in the nest cups for the next couple of hours, and those in SW(UP) seem to be well fluffed up against the colder conditions. It was 10.30am before the chicks became active, at least for a short time, and it was one of the pair in SW(LE) that was the first to look out, although after a bit of wing stretching and flapping they were back in the nest. Over in SW(UP) it was also time to exercise, with some prolonged wing stretching combined with tail lifting. Holding this position for a while, it appeared to be practicing the glide posture so often seen in the flying birds. 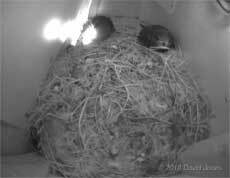 After that effort it wasn't long before the pair were once again snuggled up together in the nest cup. At 11am the temperature just outside the box is 17.6C, with the Farnborough airfield cloud base getting higher - 600ft. It is certainly a bit brighter, but there is no sunshine forecast for today. At 11.30am they are taking an interest in the exit. I don't think a parent has been back to the box since they left at 8am (I will be reviewing the day's recoding later to confirm this), so perhaps they are hungry. However, we are now entering the 'fledging window' for the pair in SW(UP) so I'm recording their activities continuously through the next couple of days so that I do not miss that moment. 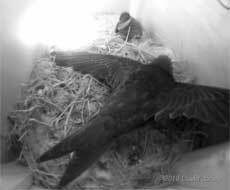 There was a parental visit just after 12.30pm - the chicks' greeting was a bit overwhelming and the adult quickly retreated to the far end of the box, and the chicks settled back into the nest cup. In between these visits the chicks spent increasing amounts of time at or near the exit, and at one stage I was able to get this picture of the pair as they looked out. I waited for ages in the hope of getting a sharper picture of the pair, but for the rest of the time I was outside only one of the pair continued to look out, while its sibling remained just out of sight to the right of the opening. As I write this at 7.30pm I see that there is a chick at the opening again following more wing exercises. 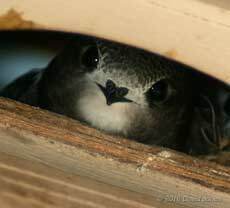 As I watched the entrance from our shared driveway I found myself distracted by one of the double Swift boxes that I put up on a house across the road from us. 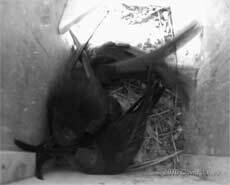 For the first time I have now seen Swift activity at them. 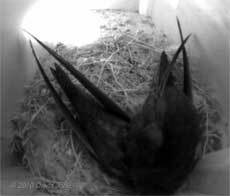 In fact I saw both boxes entered and in both cases the bird stayed for a prolonged period. 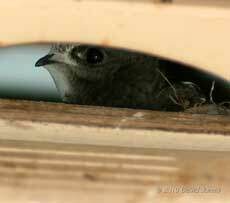 On one occasion I saw birds entering the boxes simultaneously, so things look very promising for next year. 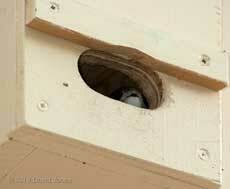 This is the pair of boxes that have already been used by Starlings and House Sparrows since I put them up in March. 14 July - Another cloudy day but the cloud base is much higher (over 3000ft) and it is much brighter. No rain during the morning, with sunny periods forecast for later. A very large, dark coloured manmade bird flew overhead this morning, partly obscured by cloud - A USAF B-52 arriving for the Farnborough air show. 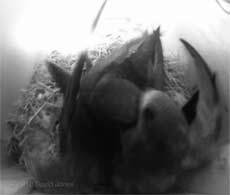 It is now 35/36 days since hatching, but in SW(UP) the chicks are not yet showing any sign of leaving as we move into the afternoon. 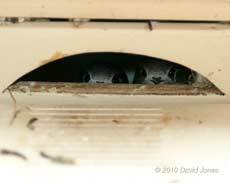 As I write this at 1.30pm the pair are huddled together at the back of the box just behind the exit, although from time to time during the morning they have been looking out. 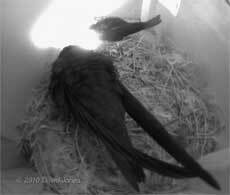 At the end of the day, both offspring are still present in SW(UP) - perhaps they will fledge tomorrow! I've just gone through yesterday's recording to establish when feeding took place, and I have added the timings to yesterday's entry. Out of interest, I have tried out a way of saving very long recordings like this one onto DVD. The original recording lasted some 17hr 38m and was recorded in high quality. What I did last night was to copy it to a DVD at the x4 playback speed. This compressed the recording to less than 1hr 28m while still maintaining a very good image quality. I deliberately left the original playback time on-screen during the transfer so that I could check the timings of the parental visits quickly. I will do the same with today's recordings. Based on the timings recorded above I should be able to fit a full 24 hour recording onto a 2 hr DVD - something I may try out before the Swifts in SW(LE) fledge. 15 July - After quite a windy night the morning is grey and wet, with just the occasional brighter moments - and SW(UP) still has its young occupants at 12.20am. Around 10am I wondered if we were about to see them heading out. 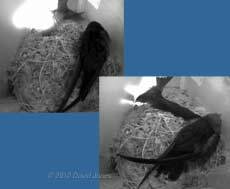 There was the most vigorous exercise session yet, with wing stretching, along with a limited amount of flapping, as well as tail stretching and twisting. When one of the pair started exercising very close to the exit I thought that it may chose that moment to leave, but it moved back to join its sibing. The exercises continued for a while, and included several 'visits to the flight simulator' as one or the other bird held itself in a typical gliding posture - a picture almost identical to one recorded a couple of days ago! 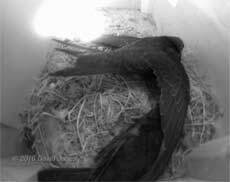 Obviously, all that exercise was quite tiring, as by 10.45am the pair were once again snuggled down together in the nest cup, a position that has hardly changed in the following hour and a half. 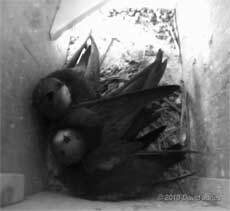 While I have yet to see either parent return to SW(UP) (I will be checking their actual visit details later), the miserable weather conditions have encouraged the whole family in SW(LE) to spend much of the morning huddled together. 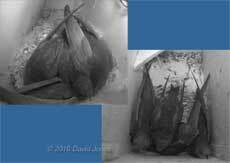 Back in SW(UP), the chicks' slumbers were brought to a sudden end at around 12.40pm when one of their parents returned with food, its face almost disappearing into the gape of a chick in this image which is blurred thanks to the movement of both birds. 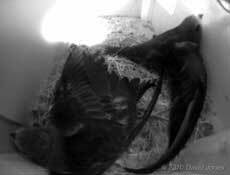 As usual, after the delivery is made the adult spends time cleaning the nest (appearing to eat the faecal sacs that it finds) before settling down with its offspring for a short time. 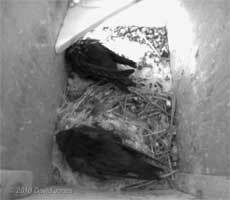 Well, it is now 8.20pm, and the pair in SW(UP) are hanging on in the box. 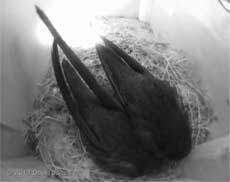 In fact, as I write this the whole family is snuggled close together in the box. It is 18C outside, but the constant breeze makes it feel quite a bit cooler. With fledging getting closer for the chicks in SW(LE) they have also been taking their first looks outside, although the front-facing entrance doesn't make it easy to record this from the driveway. There's actually one looking out as I write this at 8.30pm. 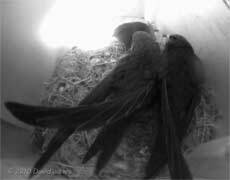 When the parents left SW(UP) again at around 9pm, the two chicks had another energetic wing/tail exercising session, but by 9.30pm both Swift families were in their overnight huddles.